Small deciduous tree or shrub, unarmed, round-crowned, 6–15 m. tall, glabrous. 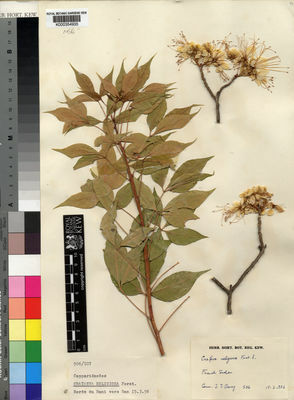 Leaves petiolate; leaflets shortly petiolulate, elliptic or elliptic-lanceolate, 3–12.5 cm. long, 1–4.8 cm. wide, acuminate at the apex, cuneate at the base and somewhat decurrent into the petiolule, slightly unequal sided; petiole 2.5–8.5 cm. long. Inflorescence-axis l–2.5(–7.5) cm. long; pedicels 1.5–4 cm. long; flowers appearing before or just after the flush of new leaves. Sepals 4, deltoid or lanceolate, up to 4 mm. long. Petals 4, ovate, eventually up to 30 mm. long, 17 mm. wide, the 2 adaxial ones generally somewhat the larger, clawed, white or yellowish. Stamens 2–3.5(–5) cm. long, white with purplish anthers. Gynophore stout, 2.5– 5 cm. long or reduced and the gynoecium ? non-functional. Fruits globose, 4–5 cm. in diameter, yellowish. Scattered-tree grassland, riverine forest and old termite-mounds; 600–1400 m.
Dale & Greenway, Kenya Trees and Shrubs p. 121, fig. 23 (1961). W.J. Eggeling, Indigenous Trees of the Uganda Protectorate, ed. 2: 73, photo. 11, fig. 18 (1952). F. W. Andr., Fl. Pl. A.-E. Sudan 1: 47, fig. 36 (1950). J.P.M. Brenan, Check-lists of the Forest Trees and Shrubs of the British Empire no. 5, part II, Tanganyika Territory p. 115 (1949). Hutch. & Dalz., Flora of West Tropical Africa 1: 86 (1927). DC., Prodr. 1: 243 (1824).